Yesterday I made fig jam. Jan decided that we should make tonight’s dinner a cheese and fig jam tasting. I could run out and just buy some crusty bread, but fresh crackers see the better choice. While Jan likes my crackers with things like za’atar in them, her favorite is plain old crackers. Since the star of tonight’s dinner is the fig jam, I thought I would make them fairly plain—OK, I broke down and added some orange peel. Looking at my past posts, I have never put up a recipe for just plain cream crackers—that would be silly, it is just like the other crackers, but without the extra things. 1. Put 4 cups of flour, the baking powder, sugar, and salt into a large bowl and mix well. Tip: I run the dry mixture through a flour sifter 4-5 times to get a good even mix. I would use Kosher salt, but the crystals are too large to go through my sifter. 2. Put the softened butter into the flour and mix it in well. Tip: Use your hands to work the butter into the flour completely. The flour should look a bit like wet sand when you are through. You are trying to get as much of the butter absorbed by the flour as you can. 3. Put the egg in a two cup measuring cup and lightly beat it. 4. Add enough cream to make one and one third cups (eggs and cream together). 5. Make a well in the flour mixture and pour the cream mixture into it. Stir briefly, until most of the flour has been moistened. Tip: A little dry flour is OK, but you may add another teaspoon or two of cream if there is a lot of dry flour in the bottom of the bowl. 6. Turn out the dough onto a board (a pastry marble if possible) and knead the dough until all of the dry flour has been incorporated, about five minutes. Note: When I make these crackers with cold butter you had to be careful not to overwork the dough and melt the butter into the flour. With this method the more you knead the dough the better. Since the butter is binding up most of the flour, you need to help the dough make as much gluten as it can. 7. Divide the dough into quarters and form them into smooth balls. Put them in a large bowl and cover them with a damp towel. 8. Dust a clean flat surface with two tablespoons of flour and press one of the dough balls into a 4 inch flat square about one half inch thick. Tip: Use a board scrapper to push in the sides of the square, so that any breaks in the edges of the dough are smoothed out and the dough is a fairly even rectangle. 9. Turn the dough over, so that both the top and bottom are well coated with flour. 10. Move the oven rack to the top position and pre-heat the oven to 400° F.
11. Roll the dough out into a 12 inch square about a ¼ inch thick. 12. Transfer the dough square onto a sheet of parchment paper, the size of a large, flat, lipless, cookie (baking) sheet. 13. Roll the paper and dough together into a cylinder, to keep the dough from drying out, and let it rest for 15 minutes. 14. While the first dough is resting, repeat steps 10-15 with the second dough ball. 15. Unroll the first dough and starting from the middle of the square of dough roll it out into a rectangle at least 1/8th inch thick (the thinner the better). Tip: Leave the dough on the parchment paper while you are rolling it out. You want the dough to cover most of your baking sheet, but you do not want it drooping over the edges. Note: The parchment paper will tend to pucker as you are rolling out the dough. Grip the edges of the paper on opposite sides and pull to smooth it out, before continuing to roll out the dough. 16. Use a rolling dough cutter to cut the sheet into individual crackers. 17. Slide the parchment paper with the crackers onto the baking sheet. Tip: Do not try to separate the crackers at this point. After they are baked they separate easily along the cut lines. 18. Brush the tops of the crackers with cream and, if you desire, sprinkle each cracker with a few grains of Flor de Sal or Kosher salt. 19. 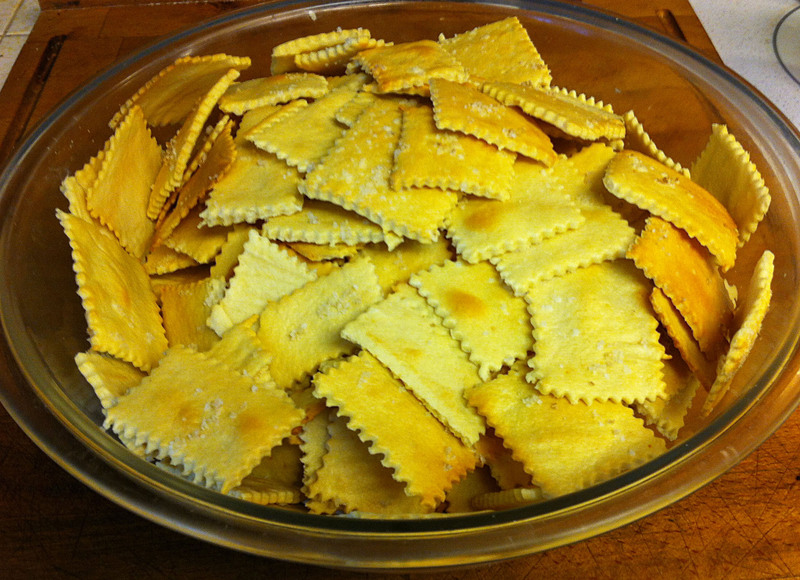 Bake crackers until they are starting to have some golden brown spots, about 15 minutes. Rotate the tray about half way through the baking time. 20. When done remove the crackers to a wire rack and let them cool. 21. Repeat steps 9-21 for each dough ball. Tip: You may overlap the tasks and roll out a second ball at the same time the first is resting or baking. 22. Separate the cooled crackers and set any that are near over done aside. Place the remaining crackers, loosely, in a baking pan and set them in the cooling oven for 10-15 minutes. Tip: This second cooling bakes dries out the crackers and crisps them quickly. If you do not do this, the crackers will be a bit soft and chewy for the first few hours. By the second day they will dry out completely and be crisp and crunchy. If they last three days, which they rarely do, store them in an airtight container at room temperature.